Yesterday at the AASL President’s Program speaker 2013 AASA National Superintendent of the Year Mark A. Edwards from Mooresville (NC) Graded School District spoke eloquently on the role that school culture and vision play in his district’s successful technology “conversion.” While he described the investment Mooresville is making by leasing computers for every student, faculty, and staff member in the district, he focused on the idea of “all in!! !” as much or more than the tools themselves. Although I have not yet read his book, Every Child, Every Day: A Digital Conversion Model for Student Achievement, Dr. Edwards clearly outlined a school culture context in which everyone is invested in and committed to providing students with the most engaging, collaborative, real-world learning experiences that lead to student (and educator) success. Dr. Edwards talked about six ingredients in the Mooresville initiative. It was compelling to note that only two of them were directly related to technology: 21st-century tools and rich and intensive data used by students, teachers, and parents to guide and monitor learning. The other four ingredients were: building the culture, building capacity through ongoing professional development, “all in!! !,” and ubiquitous leadership. (It is no surprise that Dr. Edwards is now writing a book about distributive leadership.) What should strike all educators, and maybe school librarians in particular, is that everyone has a leadership role in this model, which supports the culture of collaboration in the school. Thank you for an excellent talk, Dr. Edwards, and for spreading your vision far and wide across the country. You have the eyes and ears of other educational leaders. We look forward to hearing more about the success in Mooresville. Dreaming of summer vacation? We all do, but summer break for some students may mean they will come back in the fall at a disadvantage. When the final bell signals the end of the school year, teachers, school and public librarians, parents, community members, and administrators should have a plan in place to support readers during the two month hiatus. Remember the adage, “it takes a village…” Collaboration between all these groups should promote access to reading materials even while school is not is session, and research shows that children benefit from having books in the home. Richard Allington, reading researcher and consultant, is the co-author of a new book, Summer Reading: Closing the Rich/Poor Achievement Reading Gap (Teachers College and International Reading Association, 2013). In a recent SLJ blog, Curriculum Connections, (Eames, June 4, 2013) Allington answers questions and offers ideas for making a difference, and shows how all the stakeholders can collaborate for student success. Be sure to put this book on your summer reading list! In order to ensure that all children have opportunities to maintain literacy skills and fluency, we may need to change our school policies about materials that are usually locked away during the summer, and to find other creative ways to make sure books get into the hands of those kids who need them most, even if we risk losing some resources. This is a topic of conversation that surfaces in school library circles in late spring-early summer. Here are some ideas that have appeared recently within a variety listservs, blogs, and twitter. Students are allowed to check out a certain number of books for the summer, returning them in the fall. 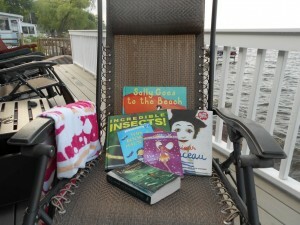 Genres of books are loaned to the public library for summer circulation. Promotion of public library spaces, programs, and collections. Students get public library cards before they leave for the summer. Some classes visit local public library, are introduced to librarians and programs for youth. Some school libraries are open to students, parents, teachers for self selection and self checkout when the building is open, even if the teacher librarian is not there. Summer reading blogs/social media sites for students offer a virtual space for sharing ideas and thoughts about books and other materials. Newsletters and suggested reading lists (print and electronic) inform students, teachers, parents, administrators, and community members about summer reading. Joint programs between school and public librarians are funded by grants. Joint programs with local social support networks for children, such as Boys’ and Girls’ Clubs, YM/YWCAs, etc. Little Free Libraries in neighborhoods, grocery stores, malls, etc. Beth Redford, school librarian at the Richmond (VT) Elementary School has a book bag program for all her students, K-4. They are allowed to select ten books to take home for the summer. Kids are really excited to participate. Steve Madden, school librarian at the Camel’s Hump Middle School in Richmond, VT, has collaborated with the Vermont Department of Libraries and the Children’s Literacy Foundation, to write grants to construct and supply book collections for the Bolton Little Free Libraries. Based on the Little Free Libraries in Wisconsin and elsewhere, book collections are set up in small enclosed bookcases in areas of Bolton, a town with no public library. Steve continues to refresh the collections that operate on the trust system. His bike is set up for summer deliveries, too. Little Free Libraries have sprouted up in lots of places in Vermont. Is there one in your neighborhood? Would you like to start one? Allington, R. and McGill-Franzen, A. (2013) Summer reading: Closing the rich/poor achievement gap. New York: Teachers College Press. In 2011, Maria Cahill, Rebecca McKee, and I conducted a study of state-level librarian conferences. Our research questions centered on the professional development focused on each of the five roles of school librarians offered at these conferences. We conducted a content analysis and reviewed the data in several conference categories and we looked at the data across all conferences as well. Does that mean that school librarians are not consistently practicing this role? Or are we not submitting conference session proposals that spotlight our instructional partnerships? Or are conference planners not selecting instructional partnership sessions from among those proposed? For whatever reason, many of us believe it is essential to counteract this trend. Some in the school librarian profession are renewing our commitment to presenting workshops and conference sessions focused on the benefits to students and educators of classroom-library collaboration for instruction. I am a member of a team of school librarians and classroom teachers who will share our instructional partnership experiences at the upcoming American Library Association (ALA) conference in Chicago later this month. Judi Paradis and her teaching partner first-grade teacher Marianne Duffy will represent the elementary school perspective. Sabrina Carnesi and her teaching partner Naadira Mubarak will share their collaborative work at the middle school level. Stacy Cameron and I will share our high school examples. What is the core of 21st-century school librarianship? How does OUR core relate to the Common Core State Standards and other state standards? What are the skills, dispositions, responsibilities, and self-assessments we can apply to co-achieve uncommon success? This preconference will provide strategies for demonstrating the school librarian’s central role in the academic program through practicing instructional partnerships to ensure success for K-12 students, teachers, administrators, librarians, and for the school librarian profession, too. If you are headed to Chicago to attend the ALA Annual Conference, I hope you will consider attending our preconference workshop. It will be held on Friday, June 28th from 8:30 a.m. to noon. For more information about all of the preconference workshop offered at the conference this year, visit the AASL Web site. Moreillon, Judi, Maria Cahill, and Rebecca McKee. State Library Conferences as Professional Development Venues: Unbalanced Support for the AASL-defined Roles of the School Librarian. School Library Research 15. 29 July 2012. Web. 06 June 2013 <http://www.ala.org/aasl/slr/volume15/moreillon-cahill-mckee>. Along with AASL President Susan Ballard, I co-edited the just-released Best of KQ: Instructional Partnerships: A Pathway to Leadership. Susan and I had the opportunity to select outstanding articles written by scholars, researchers, and practitioners in the field. Gleaned from more than a decade of issues of Knowledge Quest, the journal of the American Association of School Librarians (AASL), this book attests to the fact that the call to serve in the instructional partner role is not new AND it is timely! Check out the press release on the ALA Web site. In the changing landscape of 21st-century education, this role may be more imperative than ever. Whether your school is in the process of “reforming” or “transforming” the academic program (see Judy Kaplan’s May 28th post), it is essential that school librarians are fully engaged and yes, lead, in these efforts. 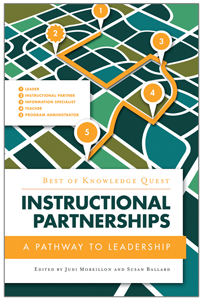 The Best of KQ: Instructional Partnerships is organized in three categories: instructional partnerships in the broad context, research related to instructional partnerships, and classroom-library instructional partnership in action. The authors of the articles in the book provide a framework, research evidence, and examples from their own practice to help school library colleagues take the lead. Kudos to all of you! Implementing instructional partnerships is not easy. It requires many of the “habits of mind” (Costa and Kallick) expected of 21st-century learners including flexibility, persistence, practicing critical thinking, reflection, and metacognition, and above all, continuous learning. If educators expect P-12 students to achieve these dispositions and practice these behaviors, then it behooves us to model these for them. Creating, developing, and sustaining instructional partnerships with colleagues is one way to do just that. AASL has made the “Coteaching” Webinar that Susan and I hosted in March 2012 freely available on the Web for thirty days. Several authors from the KQ 40.4 “Coteaching” issue shared their experiences during the Webinar; some of their articles were reproduced in this Best of KQ: Instructional Partnerships monograph. Costa, Arthur L. and Kallick, Bena. (Eds). Learning and Leading with Habits of Mind: 16 Essential Characteristics for Success. Alexandria, VA: Association for Supervision and Curriculum Development, 2008. Print. Moreillon, Judi, and Susan Ballard. (Eds.) The Best of KQ: Instructional Partnerships: A Pathway to Leadership. Chicago: American Association of School Librarians, 2013. Print.